Would you like your sales counter to run like clockwork? Would you like your sales staff to be able to quickly and easily process your customer sales and requests? Would you like to have instant access to your sales figures and graphs for the previous week, month, year, etc? Check out EVE's Sales module. This is a fully-featured Point Of Sale (POS) program that is simple to learn, yet powerful to run. You will find your sales staff are quickly able to process sales receipts, gift card sales and handle customer accounts. Think it is a lot of work to enter all of that inventory information in the first place? Think again! EVE lets you import all of your product lists including Part numbers, descriptions, prices, etc. Price updates are made ease too ! 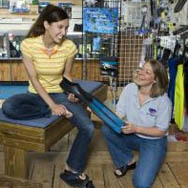 The Sales Module forms the core of your dive center’s point of sale system. Through the Sales Module, you can issue invoices, refunds, gift cards, gift certificates and quotes. You can sell courses, trips, charters, room bookings, club memberships, air fill cards all at the Point of Sale. EVE will automatically enroll customers on the appropriate course/trip for you as part of the sale. Receipts and invoices can be printed on any Windows based printer and most specialized receipt printers. Connect a barcode scanner, barcode printer, customer pole display, magnetic stripe reader and cash-drawer to your PC to create the complete electronic point of sale system. Maintain accounts receivables and default Discount Bands for privileged customers. A powerful Search Wizard allows all transactions to be easily referenced. You can export your sales information to the QuickBooks accounting program or to Microsoft Excel. The EVE profit tracker allows you to analyze how much money you are making. Daily / weekly / monthly / yearly sales reports can be produced in seconds. Tax reports are a synch. You can also use EVE's powerful Sales Search Wizard to analyze your sales; see which suppliers products sell best, see trends in sales of different products throughout the year. The program is designed to be user friendly; staff training takes only a few minutes. Your customer and employee of the month can be easily identified for possible awards and cross promotions with other businesses. This encourages competition among staff members, making them more attentive to customers. All the while you are busy selling on the shop floor, EVE is busy collating and preparing your activity ready to congratulate your customers on their recent purchases and recommend add on sales and activities. Using EVE's powerful CRM abilities, increases your divers activity and spending with you. EVE is so much more than a point of sale system.